As renewable output rises, European power markets are slowly but steadily moving towards implementing capacity remuneration mechanisms for flexible generation. In this environment there are some interesting commercial lessons to be learned from the UK capacity market implementation experience. European power markets are slowly but steadily moving towards implementing capacity remuneration mechanisms for flexible generation. A consistent pan-European solution for capacity remuneration looks unlikely. Instead the approach and pace of implementation is being driven by security of supply concerns in individual countries. However a regulatory consensus is emerging as to the need for some form of remuneration for flexible capacity as renewable generation volumes rise. Theoretical discussions are raging across Europe as to the ‘missing money’ problem of under remuneration of peaking capacity, the academic basis for capacity payment intervention. But ultimately capacity remuneration implementation is likely to be driven by practical rather than academic considerations. In the absence of capacity payments (or much higher power price volatility), renewable capacity subsidisation across Europe will squeeze flexible generator margins to the point that assets close. The current capacity oversupply situation across much of Europe may provide a temporary buffer, but ultimately plant closures will undermine security of supply. Capacity payments in power markets are not a new concept. Several markets in the US have implemented capacity markets with varying degrees of success. There are also European markets that have some form of capacity payments e.g. Ireland and Spain. But for the larger North West European power markets, the design & implementation of capacity payment mechanisms is a relatively new step. Central buyer solution: for example as has been implemented in the UK in 2014 (for capacity delivery in 2018/19), driven by security of supply concerns over a rapidly tightening system capacity margin. Supplier obligation solution: for example as is being implemented in France in 2015 (for 2016/17), driven by concerns over capacity to meet peak winter heating load. Strategic reserve payments: for example the ‘Strategic Generation Reserve’ contracts that have been awarded in Belgium in the lead up to the current winter to address system tightness concerns after nuclear outages. 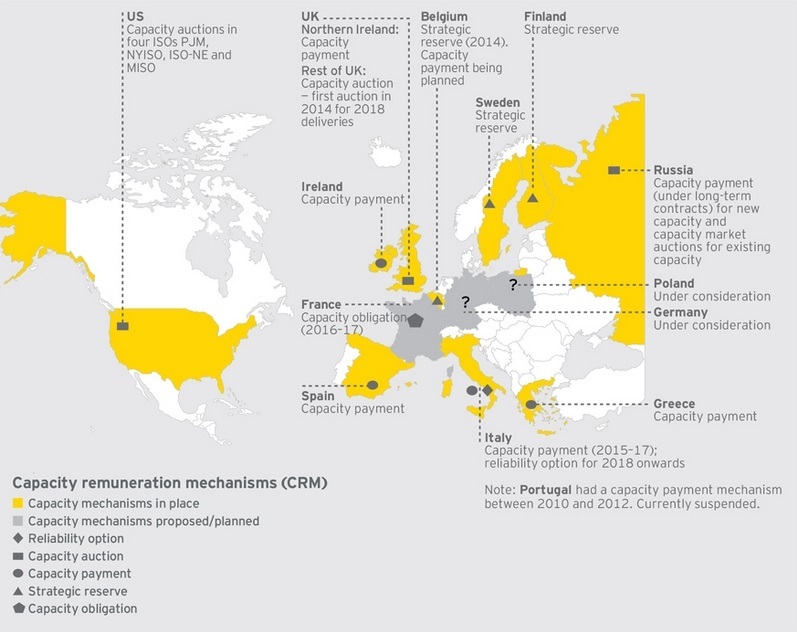 Chart 1 provides a summary of the approach to capacity payments across Europe. Strategic reserve payments are being used as a convenient temporary (or ‘stepping stone’) solution to address system capacity issues. There is typically a lower regulatory hurdle for introducing these payments compared to transitioning to a more structural capacity market solution. The payments are being introduced under the guise of greater powers for the system operator to contract reserve. But there is increasing disquiet within the industry as to the lack of transparency around remunerating capacity in this way. For example, the UK Supplemental Balancing Reserve (SBR) payments are being used as a somewhat opaque ‘stop gap’ means of remunerating capacity over winter periods, while the more structural capacity market solution is rolled out. Germany has taken a different but equally controversial approach by mandating certain assets of strategic system importance remain open for reserve purposes. Oversupply in Continental power markets has reduced the immediate urgency for structural capacity remuneration solutions. But as time passes, increasing renewable output will only further compromise the economics of flexible peaking assets. It is unlikely that politicians and regulators will be willing to stomach the power price volatility required to keep adequate peaking capacity on the system. And local transmission constraint issues (e.g. in markets like Germany) are also pressuring regulators to respond. A number of countries across Europe are now openly considering more structural capacity remuneration solutions e.g. Germany, Belgium, Poland and Italy. The momentum for capacity remuneration is only likely to increase over time with interesting implications for asset margins and investment returns. The UK led the way in Europe with implementation of traded wholesale gas and power markets. This was driven primarily by a pro-liberalisation regulatory agenda. The UK again finds itself leading the way with the design and implementation of a capacity market. But this time it is driven more by reactive necessity than proactive ideology. The UK is facing a rapid decline in system capacity margin, at the same time growth in renewable output threatens to close a number of thermal assets required to provide peaking capacity. The UK capacity market implementation is not a shining example of how to design and deliver capacity support from a policy perspective. But the commercial ‘lessons learned’ by UK generators in the lead up to the first auction have a broader relevance for generators across Continental power markets as they prepare for capacity payment mechanisms. Capacity payments add a more stable margin stream for flexible thermal assets. But they tend to have an important adverse impact on wholesale energy margin by supporting higher levels of system capacity. This tends to increase competition to provide the marginal MW of capacity and therefor reduce energy market rents. Analysis of the interdependence between capacity and energy pricing and the associated impact on generation margins, provides an important foundation from which to understand the commercial impact of capacity payments. As capacity constraints begin to bind, the cheapest source of incremental flexible capacity will typically be provided by keeping open existing thermal plants that have a competitive fixed cost structure and that have capital costs which are already paid down (e.g. less efficient CCGTs). Capacity payment support can fundamentally change the economics of these assets (most of which are currently cash flow negative). Once existing capacity options are exhausted it is important to understand the economics of new build options. Capacity payment mechanisms may skew new build investment economics. Capacity payments tend to favour lower capex small scale peakers (e.g. diesel generators, reciprocating engines and small gas turbines) ahead of more efficient but more capital intensive technologies (e.g. new CCGTs). Capacity payments also impact the financing opportunities for new plants. A consensus is emerging across lending banks that debt sizing should be based on the capacity payment margin stream, with equity required to support the balance of the investment. Lower price bound: A reasonable lower bound benchmark for the capacity prices (in a market that faces a capacity constraint) is provided by the fixed costs of thermal peaking assets that would otherwise close (e.g. less efficient CCGTs). Upper price bound: Reasonable upper bound benchmarks can be derived from the costs of delivering incremental new flexible capacity. It is important to note however that capacity mechanism design may skew this benchmark towards lower capex smaller scale peaking assets rather than CCGT. Perhaps the most important conclusion from preparations for the UK capacity market is to develop a strategy for capacity remuneration over an asset lifetime horizon. It is human nature to focus on the most immediate problems to hand. In the case of capacity payments this can mean focusing on capacity returns over a near term horizon e.g. defining a specific bidding strategy for the next capacity auction. But it is much more important to develop generation portfolio and investment strategies around the interdependent evolution of wholesale energy and capacity margin streams over a longer term horizon. This means deriving capacity bids based on a risk adjusted asset lifetime ‘Net Present Value’ view. It is easy to ignore capacity remuneration until there is greater certainty around policy design and implementation. But the UK capacity market experience suggests that the specifics of policy design do not preclude generators from taking proactive steps to alter their investment and generation portfolio strategies. In fact there is a clear first mover advantage from anticipating the structural impacts of capacity payments on asset margins, portfolio structure and investment strategy.